Banff National Park (BNP) runs north westerly from Canmore to the Columbia Icefield. It encompasses 6,641 sq. km of pristine wilderness and is the birthplace of Canada’s national park system. Established in 1885, after three railway workers discovered a cave containing hot springs, BNP has become a world-class destination, hosting an estimated 4 million visitors each year. 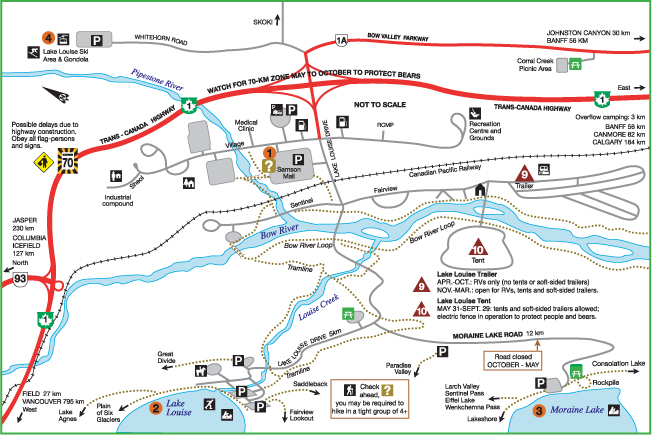 Our map of Banff National Park includes details 8 of the many popular attractions in the park and also provides you with the locations of the campgrounds. Within BNP are two important communities: the Town of Banff and the Village of Lake Louise. Both are located along the Trans-Canada Highway. They’re small, so it’s easy to get around either community without your vehicle. That’s great because parking is at a premium and some lots cannot accommodate large vehicles such as RVs. Street parking and municipal lots are free, but have time restrictions. “Roam” is the name of the local public transit system. It provides safe, affordable and environmentally friendly bus service throughout the Banff town site. Along the Trans-Canada Highway 1 Drive with care on this busy thoroughfare. Look for five animal overpasses just between Banff and Lake Louise, one more west of Lake Louise, all built to allow wildlife to cross the road safely. Parks Canada Visitor Centre 224 Banff Ave. Along the Bow Valley Parkway Hwy 1A Stop at roadside viewpoints and interpretive exhibits along this scenic road between Banff and Lake Louise. 25 km (30 min) from Banff Exciting cat-walks cling to the canyon walls. Interpretive Display, 1.1 km (20 min) to the Lower Falls, 2.7 km (1 hr) to the Upper Falls. Stay on the trail and away from the edge. Parks Canada Visitor Centre by Samson Mall. Ride the Gondola May 15 – Sept 30. “The Hiking Capital of Canada” is central to the best high elevation hiking in the Canadian Rockies – including the Plain of Six Glaciers, and in adjacent in Yoho National Park, the famous Iceline Trail. Along the Icefields Parkway Hwy 93 Named for the series of glaciers lining this route, the parkway is one of the world’s great mountain highroads. This drive along the “backbone of the continent” from Lake Louise to the town of Jasper takes half a day, with time to stop and admire the views. Stock up on camera supplies. 34 km (25 min) from Lake Louise A century ago, there were three “toes” of ice here. How many can you see today? 40 km (30 min) from Lake Louise – Interpretive Display 2088 m (6849’) above sea level. A short walk from the parking area leads to a view of brilliant turquoise Peyto Lake and, in July and August, an astonishing array of alpine flowers. 72 km (50 min) from Lake Louise Only 10 min by trail from the road. Look for rounded potholes and a natural arch on the canyon walls. 77 km (55 min) from Lake Louise – Interpretive Display Three rivers converge here: the Mistaya (Great Bear) River from the south, the Howse River from the west (the route used in 1807 by David Thompson to cross the Great Divide), the North Saskatchewan from the north – arising in the Columbia Icefield and emptying into Lake Winnipeg. Services available April – October. 130 km (1.5 hrs) from Lake Louise 90 min Motorized Tours take you onto the glacier. Glacier Exhibits illustrate the effects of global warming. Restaurant, picnics, rooms, guided ice walks and more. Most Services available May 1 – Oct 15. 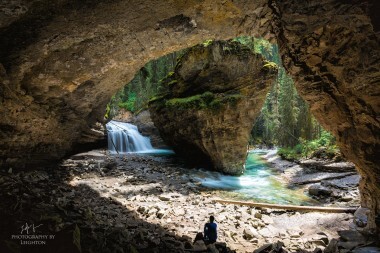 Within Banff National Park are two important communities: the Town of Banff and the Village of Lake Louise. Both are located along the Trans-Canada Highway. The Town of Banff is 130 km west of Calgary, and 850 km east of Vancouver. The airports in Calgary, Vancouver and Edmonton serve international travellers to the region. Buses run to BNP year round, from each of these three large urban centres. Rocky Mountaineer Vacations operates rail passenger sightseeing trips in western Canada, with stops in Banff from May to October. BNP is also home to Sunshine Meadows, which is one of the few subalpine hiking destinations in the Rockies that is accessible for the entire family. The Banff townsite is small, so it’s easy to get around in town without your vehicle. That’s great because parking is at a premium and some lots cannot accommodate large vehicles such as RVs. Street parking 2and municipal lots are free, but have time restrictions. “Roam” is the name of the local public transit system. It provides safe, affordable and environmentally-friendly bus service throughout the town site. 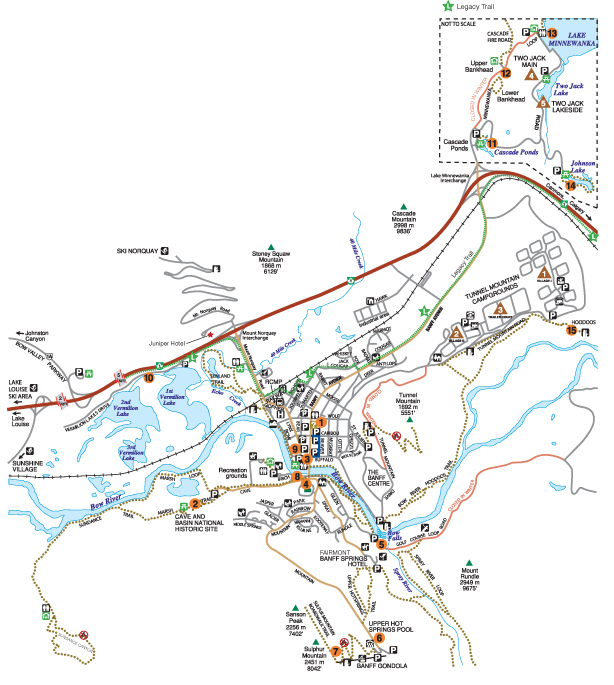 Our map of the Town of Banff includes 15 map keys of the must-sees while in town. If the weather is pleasant, you’ll want to be outdoors to breathe the clean alpine air. Check out the Legacy Trail. 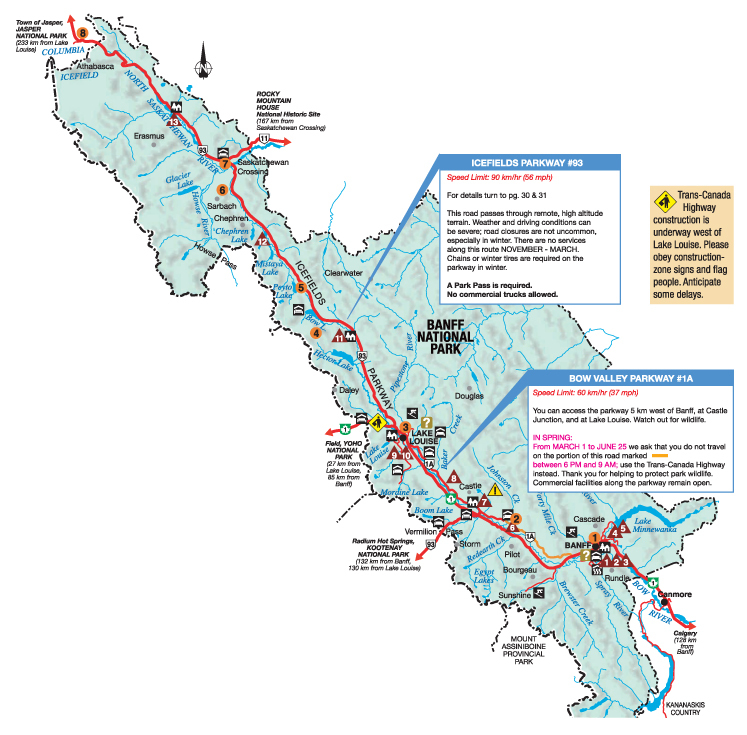 It runs 26 km along the highway right-of-way from Banff to Canmore. It is a paved, recreational trail suitable for walking, bicycling, and in-line skating. This trail is part of the Trans-Canada Trail, which winds its way through every province and territory linking close to 1,000 communities. If the weather turns, head indoors to shop or to learn about the art, culture, and history of the mountain parks at the Whyte Museum of the Canadian Rockies. The birthplace of Canada’s national park system. Flower gardens with walking path behind the Banff Park Administration Building. Great for families: FREE ADMISSION. Open Daily. Phone 403-762-1550 for more information. Magnificent views from either side of the Bow River. Mountain Avenue. Heritage Bath House Locker, swimsuit and towel rentals. Café, Day Spa 403-760-2500, and Gift Shop. Open year-round. Summer 9 am – 11 pm. Take the Gondola to the summit for breathtaking views. 20 min stroll along an interpretive boardwalk to historic exhibit. Aboriginal history, displays, live performances and demonstrations. Operated by several First Nations including the Cree, the Blackfoot Confederacy, Tsuu T’ina and the Stoney. Brings mountain history, art and culture alive. Special learning programs for young children. The turnoff is 1 km west of Banff, on the south side of the Trans-Canada Highway. Enjoy a nature stroll through these wetlands. 10 min – A favourite with locals and visitors alike. Grassy meadows, clear shallow pools, and a small beach. Picnic areas with fire pits. Accessible on foot and bicycle via Banff Legacy Trail. Charming 30-minute stroll through the surface workings of the coal mine and the outline of the old town site. Leisurely lakeside stroll to Stewart Canyon (30 min). 20 min – An easy trail circles this shallow lake. A small beach and good wildlife watching. A short interpretive trail leads to this superb view point, or book a rafting trip to view the Hoodoos from the Bow River. If the weather is pleasant, you’ll want to be outdoors to breathe the clean alpine air. Check out the Legacy Trail. It runs 26 km along the highway right-of way from the Park’s East Gate to the Bow Valley Parkway. It is a paved, recreational trail suitable for walking, jogging, bicycling, and in-line skating. As part of the Trans-Canada Trail, it winds its way through every province and territory linking close to 1,000 communities. If the weather turns, head indoors to learn about the art, culture, and history of the Canadian Rockies. The Whyte Museum of the Canadian Rockies is an exciting place to explore. Founders Peter and Catharine Whyte were philanthropists and artists, so if you like art, “The Whyte” should be on your bucket list. For more information, check out Chic Scott’s feature story. The Bow Valley Parkway is a scenic, 48 km secondary highway that runs parallel to the Trans-Canada Highway between the town of Banff and the village of Lake Louise. Its eastern portion travels through a small but vital part of the park, called the montane, that provides critical habitat for large carnivores, including wolves, cougars and bears. Protecting wildlife is the foundation of a sustainable future for the mountain national parks and a great visitor experience. 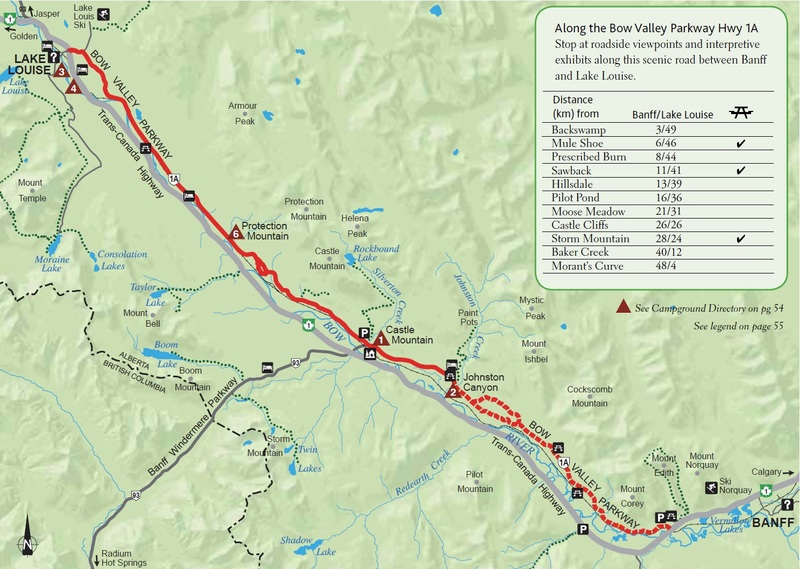 To ensure that this special area remains a high quality home for wildlife, from March 1st to June 25th, travel by vehicle, bicycle, or foot is not permitted between 8pm – 8am on the 17 km section of the Bow Valley Parkway between the Johnston Canyon Campground and the Trans-Canada Highway interchange. All businesses remain open during this period of mandatory travel restriction and are easily accessible by driving the Trans-Canada Highway and exiting at Castle Junction. This travel restriction will allow wildlife to move unimpeded across the landscape, use high-quality habitat, and engage in normal behaviour. It is part of a larger action plan to ensure the ecologically rich Bow Valley Parkway area continues as a worldclass setting for visitors to learn about and experience the park, and as a safe environment for wildlife. Parks Canada visitor centre 403-522-3833. Exhibits explain the geology and history of the Canadian Rockies. Open 9 am – 4 pm, extended hours July 1 – Sept. 29. The easy stroll around the lakeshore is stunning. Access point for more difficult climbs. Nestled in the Valley of the Ten Peaks. Hiking restrictions when grizzly bears in the area: tight groups of 4+ hikers. Open late May to early October. 4.5 km from the village; 403-522-3555 Summer Gondola runs May 12 – Sept. 30 but come back to ski Nov. – May 6.